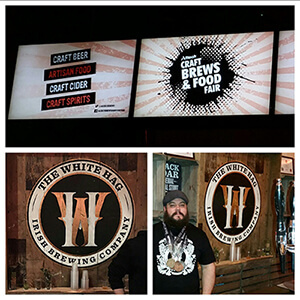 The Alltech Brews and Food Fair 2016 marked a pivotal occasion for all involved in the Ireland Craft Beer team. Not only was it the first outing for us of the calendar year, but it also marked the 1-year anniversary of our first ever outing as Ireland Craft Beer Limited. It was a year ago almost to the date that we began our Craft Beer adventure and Alltech 2016 gave us a great opportunity to meet up and reflect on how far we’ve come since last year and how far we still need to go! A year ago we were beginning the dream, this year we’re living the dream. We started the weekend off with a visit to Brewdock on Amiens Street. For those of you who have never been, it’s an absolute jewel of a bar if you love craft beer and are just eager to try something new. They have a huge selection of beer on tap and also do tasty grub too if it takes your fancy! We also had the pleasure of bumping into the Irish Beer Snob and Simon Broderick who were also having a few warm-up beers before the festival. Excited to get started, we arrived at the Convention Centre just as the doors were opening. We were immediately drawn towards White Hag Brewery who definitely excelled in providing punters with the gift of choice! They had the largest range of craft beers on tap than any other brewery at the festival and we got stuck in and started sampling. The first we tasted was the Oatmeal Chocolate Milk Stout infused with an espresso rocket. This beer provided the caffeine hit that we all needed to start the festival with! This stout is a must for all coffee lovers and Donal and Liam were in their element with this speciality, given their love of coffee! Another craft beer to remember was their Brett IPA. Adding to its sense of exclusivity and hype, this beer was off-limits until 7pm. Good things come to those who wait – that’s for sure! This year, along with giving our team an opportunity to sample new beers and meet new people, we also had the chance to catch up with and share a drink with the friends and colleagues we’ve acquired since our business began. Seamus from Brehon Brewery as quoted by Donal ‘is a man who embodies brewing, creativity and good old fashion craic’. A very fitting description! 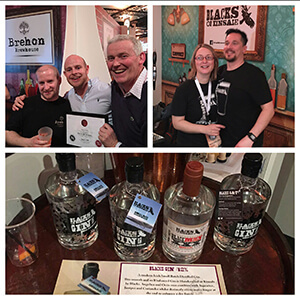 We spent some time at Brehon’s stall catching up with Seamus and also met with (who we like to call) the men behind the magic, Phil (Head Brewer) and Jordon (Assistant Brewer). On tap, they had the eagerly anticipated Shanco Dubh on cask that went down a treat along with the Stoney Grey IPA and the Killaney Red. We were also lucky enough to sample their new Oatmeal Stout, aptly named Brehon Rising given the year that’s in it! We also visited Independent Brewing who were sharing their stand with the guys from Woodkey Brewing. We spent some time chatting to Kevin and giving him a run-down on the various locations that we’re exporting to. Both breweries collaborated to create a very moreish Black IPA. We were impressed! The next stop was a trip down ‘Cider Lane’ and Long Meadow was first on the list. We spoke with Catherine and sampled their Oak Aged Barrel Cider which was a welcomed pallet cleanser and left us feeling refreshed. Another cider which we are all slightly obsessed with is Dan Kelly’s Cider. This Irish Cider can only be described as flawless. Their new Whiskey aged cider was phenomenal and had a very unique and high quality taste. I challenge cider lovers to have a taste of Dan Kelly’s cider and attempt to revert back to Bulmer’s…it won’t happen; I’d bet my all my beer tokens on it! Olan is the cider maker and was in high demand with the eager beer and cider enthusiasts probing him for his trade secrets. On a separate note, Olan featured on RTE’s Nationwide recently and proudly showcased their fantastic Irish products. Blacks of Kinsale are an old favourite of ours and we were lucky enough to sample their new Worlds End Chocolate Milk Stout. It was smooth and almost had the texture of a milk. They also have a new range of Gin on the market which we have no doubt will go down a treat given the recent renaissance of Irish Gin. The all-day event on the Saturday gave us an excellent opportunity to meet with and discuss our business with other breweries. And since the festival we are proud to add Rascals Brewing to our selective portfolio. They have a unique range of beers including cans, which is much sought after on the international market. We look forward to working with them. Other Irish beers that stood out from the day was a raisin and oatmeal stout from St. Mels Brewery in Longford,Jack Cody’s St Patricks Stout and the Sunburnt Irish Red Ale from the guys at Eight Degrees. Overall we had a really fantastic weekend. We are among the lucky few who have the unique opportunity to combine work with pleasure and our passion with our business. Alltech is a brilliant festival and gives our Irish Breweries a well-deserved platform to showcase what they do best. We noticed quite an increase in numbers this year compared to last also which we hope marks the onset of another year of Irish craft beer reaching new heights in popularity around Ireland (and across the globe!). We look forward to next year’s Alltech event and will continue working hard over the coming months to convert todays dreams into next year’s reality! If you have any questions about Alltech or any of the breweries mentioned above, please give us a shout! Were you at the festival? let us know!